When does a large hiking party turn into something more like intimidation of a small Palestinian community? One of our shipmates, who lives and works in Yanoun, a Palestinian village in Israel's occupied territories, reports on the day the settlers came calling. The Israeli settler, with his two small children and with one big gun slung across his shoulder, stopped my colleague Olav during his morning run and politely but pointedly plied him with questions: "How many internationals are in Yanoun? How long do you stay? Why are you here? And what was the problem with the tourists?" The first few questions are easy. There are four of us here, providing a permanent international presence to this small farming community which is home to 100 Palestinian people; around 40 adults and 60 children. We stay for three months and are then replaced by a new team of internationals. We are here to provide presence and to observe, because Yanoun is surrounded by illegal settlement outposts, and in 2002 the inhabitants were driven out by settler violence. The last question posed by the settler is far more complicated. 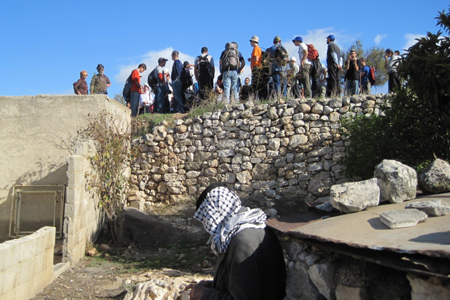 By "tourists", he meant the large group who had together come over the hill from Itamar settlement the previous day. We were alerted at around 8.30am that there were 80 settlers at Um Hani's house, but received no more immediate details. Of course this is alarming, given the well documented history of attacks on the village and our knowledge of recent settler violence nearby. In addition, the sheer number was twice the adult population of Yanoun. We took the short but tense journey with the mayor to the house, which is relatively isolated, to find out what was happening. The settlers were just on the other side of the house when we arrived; we could clearly see them listening to their armed guide. They had walking shoes, backpacks and cameras  a hiking group. Their guide was talking to them in Hebrew and after a few minutes, during which time we took pictures of them  and some of them returned the gesture  they moved on down the hill towards the village well. The well, providing all the drinking water for the village, is visited by settlers every so often; the men sometimes bathe in the well and have been known to bring their dogs and let them swim in the water too. The guide led them down to this spot as the Yanoun villagers, mostly out of their houses by now and watching events unfold, watched from a safe distance away up the hill. Rashed, the mayor, approached the group as some of the men in the group were beginning to get into the well. He had an exchange with the guide, who he later told us he recognises from the nearby settlement of Itamar, and the guide then requested of the men that they moved on, and they did. So... what's the problem with the tourists? The vast majority of them weren't armed, they moved through the village, they began to swim in our drinking water, but stopped when it was requested. It is undoubtedly very threatening for the village when large groups come, as it takes a while to establish their intent, but this group was not injuring anybody. There are reasons to suggest it is inappropriate for them to be walking here; the Yanounis are Palestinians living under occupation in Palestinian territory, and the hiking group is from an Israeli settlement in very close proximity. This village has suffered greatly from direct violence from local settlers in recent years. But still, even inappropriate behaviour does not have to be threatening; it would still be possible to argue that the group weren't really "doing" anything. The thing to worry about is what this kind of walk can represent, and its wider context. Without doing too much violence to the activity, it seems it can be connected directly to the field of Zionist education known as Yediat ha-Aretz; literally, "knowledge of the land", which was established in the 1920s to advance patriotism. The tiyul, or hike, was an important feature of this project; "a crucial means of linking nature to nation, of connecting Jewish history in Eretz Yisrael to a set of Zionist political claims in the present, therein fortifying the latter." Rebecca Stein (just quoted) has written usefully about these practices, pointing out that the political functioning of the tiyul still applies. "Continuing through to the present, the tiyul would be frequently called upon to advance Israeli political claims in the occupied territories." She also suggests there is a need to "expand our sense of military occupation by considering how everyday cultural practices"  such as hiking  "can supplement the formal work of the Israeli army". Sometimes people do just walk here, but it didn't feel much like that was the overall intent of this group. A point was made, a land claim was being supported, the message felt clear although it is difficult to articulate when it is equally possible to look at the group and only see hikers. The problem with the tourists, apart from the gun on their leader and the attempts to swim in the well, is that they are not quite tourists. We are told some Israelis come hiking here, the wells are on hiking maps and they go through peacefully; we are told they are no problem. Maybe they don't even know or really understand about the history or politics here, difficult though that is to believe. 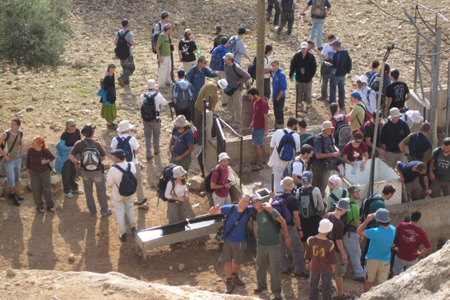 But it seems that the hikers from Itamar were contributing to something quite difficult to quantify; they were showing the Yanounis that they can just come right into the village, approach the well, walk across the fields and make connection with the land. They were making their presence here, in the settlements that are illegal under international law, appear benign and leisurely. They were creating the incredulity behind the question, "What's the problem with the tourists?"